This last week I took quite a number of photos, and the choice for the image for the deck was a little more difficult. In the end it came down to a choice of several from the Trip out west that Nikhil, Naseem and I took last weekend. Of all the water crafts that were at the conservancy, one in particular caught my attention, it was a tug-boat (I think they’re called that), it was quite distinctive from the other shallow boats and canoes on the water, and definitely more appealing than the barge that was moored nearby 🙂 It reminded me of cartoons I watched as a child, and I fully expected to see either Bluto or Popeye on deck! I was pointing the camera roughly north-west, and that area was still a bit bright. Also the conservancy water is “red” like out creek-waters, giving that dark appearance. 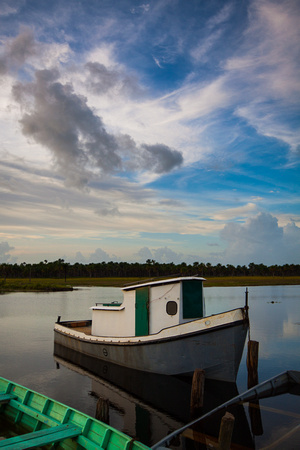 Thanks Brian, I am very partial to dramatic clouds myself 🙂 It is sometimes tempting to just get the boat, but including the nice sky/clouds really adds to it, I think. Lovely landscape Mike. This is definitely more appealing than any of the photos I got. The boat is more likely a small trawler though, it has none of the stuff needed for a tug. Hi Mike. I love the sunken reflection but more so, the reflection in the sunken boat! What an awesome find and great shot! Nice one – somehow the scene seems not quite idyllic and slightly business like… For me it’s a reminder that every scene/area/photo captures something from someone’s life and that that life is all around us if we only look for it… Someone has to go to work in that boat – ever wonder what their life might be like?